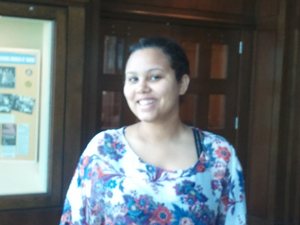 Morgan Mahone is the 2012 recipient of the Joseph Jacobs Labor Scholarship. The scholarship was established in 1983 to honor Joseph Jacobs, a long-time labor attorney who represented unions in Georgia, by the Organized Labor and Workmen’s Circle Awards Committee and the North Georgia Building and Construction Trades Council. One scholarship is awarded annually in the amount of $1,000.00, and the applicant must be admitted to or enrolled in Georgia State University and be a member of a Georgia AFL-CIO affiliate labor organization or the spouse, child, or grandchild of a member. My parents are both are employed by the United States Postal Service and are members of the American Postal Workers Union, part of the AFL-CIO. There have been several instances in my life in which I specifically remember the union contributing to the security and well-being of my family…It is a nerve-racking experience for any family when there is the possibility of unemployment looming in the distance. For my mom and dad though, the no-layoff clause negotiated by the union has brought a sense of security to them. Until next year when their contract is due to be renegotiated, we will not…be one of the many families struggling in a difficult economic climate. Congratulations to Morgan as she enters her senior year at Georgia State University! The Joseph Jacobs Labor Scholarship is administered by Georgia State University Library’s Southern Labor Archives and the College of Law’s Labor Studies Program. For more information about the scholarship, please contact Traci Drummond, archivist for the Southern Labor Archives. This entry was posted in General News, Special Collections & Archives. Bookmark the permalink.